July 29 - Saint Martha - Memorial - My Catholic Life! God loves families. Jesus Christ gravitated toward families and shared in the family love of Martha, today’s saint, and her sister Mary and brother Lazarus. Curiously, neither Lazarus nor Mary of Bethany are venerated as saints, while their sister Martha is. For many centuries, the Church’s liturgy taught that the “Mary” of Bethany and the “Mary” of Magdala were one and the same person, with the “composite Mary” feast day on July 22. The liturgical reforms after the Second Vatican Council identified the memorial of July 22 as that of Mary Magdalene, leaving unresolved whether or not she is the same person as Mary of Bethany. Today’s memorial is celebrated on the octave of the memorial of Mary Magdalene, a vestige of the Church’s prior, unofficial, thinking that Mary Magdalene was the sister of Martha. Normal, everyday family life is inherently attractive. The chatter across the dining room table, the squabbles over who forgot to feed the dog, the girls who stand too long in front of the mirror, and the boys who always leave the room a mess. The tug and pull of family life can be rough, domestic drama, but it is real drama. It’s not a video game. It’s not virtual reality. Like moths to a flame, people are drawn to healthy families, especially those from broken families. And so they come around—the only child from the house next door, the old woman whose children now live hours away, or the childless couple who wonders what might have been. Jesus came around too. The celibate Jesus, perhaps pining for the warmth of his childhood home, may have wondered what it would have been like to have had a brother and some sisters. He seems to spend a lot of time with Martha, Mary, and Lazarus. He seems to want to sit shoulder to shoulder with others around the fire, to be heard in the rustle at the dining room table, and to have a full-throated laugh when someone says something funny. Jesus wants to be part of the family. And so Jesus shows up at the family home in Bethany. Mary is attentive. She knows one man very well, her brother Lazarus. Yet Jesus is not like her brother. Not at all. There is something mysterious about him, something people talk about but which no one can explain. Mary is so honored that he is there, she just sits on the floor nearby and listens intently. Martha is honored as well, and perhaps embarrassed at the state of the house. She is distracted and worried, in the ageless tradition of women who see their homes as extensions of themselves. So she doesn’t stop cleaning and fussing, even after her guest arrives. She complains, perhaps lightheartedly, perhaps seriously: “Lord, do you not care that my sister has left me to do all the work by myself? Tell her then to help me.” The Lord answers “Martha, Martha, you are worried and distracted by many things; there is need of only one thing. Mary has chosen the better part, which will not be taken away from her.” It is part of a woman’s duty to worry. It’s a way of expressing concern and empathy. She worries about the kids, the house, the food, the family schedule, etc… because if she doesn’t worry about these things no one else will. Jesus reminds Martha, though, that worrying and distraction have limits. After Jesus rose her brother from the dead, Martha was fundamentally changed. Lazarus had been cold to the touch, dead and wrapped like a mummy for four days. And then Martha held his warm hand in hers once again. She heard him laugh out loud. And she undoubtedly asked him, as did everyone, what it had been like to be dead. Lazarus eventually died again, and was not resuscitated a second time. Martha followed a man who rose himself from the dead, and who never died again. Saint Martha, your profession of faith in the Son of God, and to the Son of God, is an inspiration to all believers. You expressed in few words the fundamentals of our faith and combined this belief with generous service to Christ’s practical needs. May we do the same. ST. JOHN tells us that “Jesus loved Martha and Mary and Lazarus,” and yet but few glimpses are vouchsafed us of them. First, the sisters are set before us with a word. 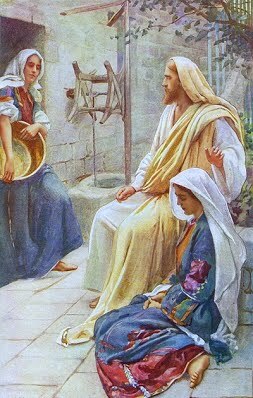 Martha received Jesus into her house, and was busy in outward, loving, lavish service, while Mary sat in silence at the feet she had bathed with her tears. Then, their brother is ill, and they send to Jesus, “Lord, he whom Thou lovest is sick.” And in His own time the Lord came, and they go out to meet Him; and then follows that scene of unutterable tenderness and of sublimity unsurpassed: the silent waiting of Mary; Martha strong in faith, but realizing so vividly, with her practical turn of mind, the fact of death, and hesitating: “Canst Thou show Thy wonders in the grave?” And then once again, on the eve of His Passion, we see Jesus at Bethany. Martha, true to her character, is serving; Mary, as at first, pours the precious ointment, in adoration and love, on His divine head. And then we find the tomb of St. Martha, at Tarascon, in Provence. When the storm of persecution came, the family of Bethany, with a few companions, were put into a boat, without oars or sail, and borne to the coast of France. St. Mary’s tomb is at St. Baume; St. Lazarus is venerated as the founder of the Church of Marseilles; and the memory of the virtues and labors of St. Martha is still fragrant at Avignon and Tarascon.